A dependency is when one transaction relies on another transaction. Some systems call this concept cross-docking. For example the fulfillment of a sales order may not occur until a purchase order is received. The transaction that relies on another document is called the 'Target' and the document that it relies on is called the 'Source'. Creating a dependency relationship is called 'Linking’. Once linked, the quantity on the Target is 'Reserved' to the Source that way one Target transaction cannot take away quantity reserved for another Target transaction. To ensure that allocations are enforced make sure 'Enforce allocation to dependencies from linked transactions' is CHECKED in Inventory Preferences. From a target transaction, you can jump to a source transaction by clicking Details --> Dependency on each respective line item. 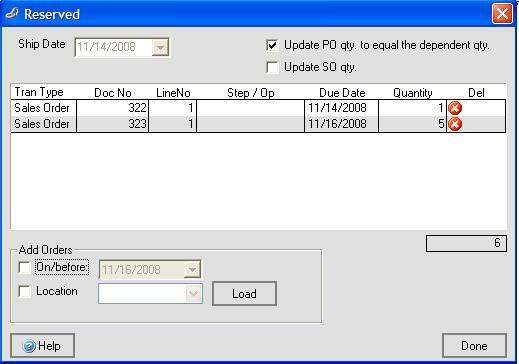 From a source transaction you can see the linked target transactions by clicking Details --> Dependency on each respective line item of a purchase orders or from the toolbar on the work order. Transactions can be linked in several ways. The most common way is to create the source transaction directly from the target, for example creating a purchase order or a drop shipment directly from a sales order. To create linked transactions from the target open the desired sales order or work order then click Activities --> Create Linked POs or Activities --> Create Linked WOs. You will then see the Reorder Analysis but only for the items on the target transaction. If you generally accept the default costs and vendors and set the source quantities as the target quantities you can use a simpler form of the reorder screen by CHECKING the 'Use Quick Reorder screen from linked transactions' in general preferences. You can also create source transactions for multiple target transactions. For example if you want to create one purchase order to fulfill multiple sales orders. This is accomplished by running the reorder analysis and selecting 'Required' for steps 2 and 3. You can link transactions when the source transaction has already been created. You do this from the source transaction and clicking Details --> Dependency on a line item of a purchase orders or from the toolbar on the work order. You will then see a dialog box showing all the target transactions. You will note that there are 2 check boxes on the top of the dialog box. Update PO qty. to equal the dependent qty: If you check this the order quantity will be set to equal the sum of all the target quantities. In the above image the purchase quantity will be set to 6. If I want to keep the order quantity independent of the target quantities then UNCHECK this box before Adding Orders or changing the quantities. For example if you already have a sent purchase order an do not want change the On Order quantity. Update SO qty: Will change the sales order quantity equal to the dependant quantity. On this dialog box, you can set the Quantity (i.e. the dependant quantity) to a number greater than 0 but less than the sales order quantity. If this box is checked then changing the dependent quantity will also change the sales order quantity. You can delete any dependencies by clicking the red x to the right of the Quantity. You can also directly edit the Quantity to a number greater than 0 but less than the target required or order quantity. To add additional orders (i.e. targets) you use click the Load button. You can filter the list by ship date and location. After you click load, you will see a similar dialog box this time with an additional column called Incl. which you can UNCHECK if you want to exclude a particular target. Click 'Done' to get back to the original Dialog then 'Done' again to get back to the source transaction. You can get visibility on the Reserved quantity in 2 areas. The item info shows the aggregate Reserved for all target transactions. Create a copy of the Required by Item Detail report and add the Reserved field. This report will show which target transactions have a reserved quantity. Copyright © 2012-1999 NumberCruncher.com, Inc. All rights reserved.